Jalapeno is not the first word that comes to mind when one hears “watermelon”. Then again neither is feta. We live in a crazy mixed up world and we’re not one to be afraid of embracing the unusual & exotic. Our Watermelon Bruschetta is all that, and more – but as unlikely as it might be to find these ingredients together, the fact that we’re using them to top off toasted, totally scrumptious slices of our impressively delicious Pugliese means it’ll all work out. It’s bruschetta with a tasty kick in the pants thrown in for good measure. Some people like to live on the edge, we like to bake on it. Heat broiler. Arrange pugliese slices on a baking sheet and toast under broiler until lightly golden (approximately 1-2 minutes). Combine watermelon, jalapeño, basil, salt, pepper and olive oil in a large mixing bowl. Toss to combine. 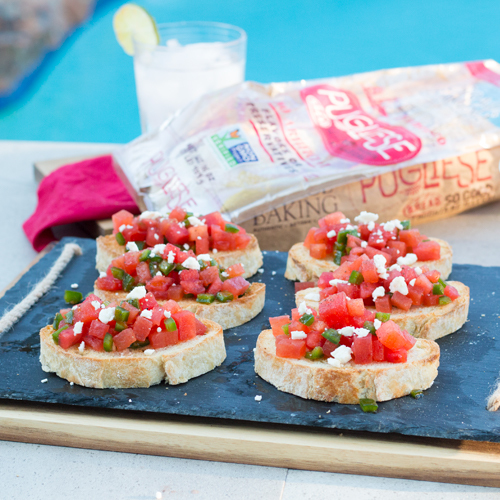 Top each toast with a heaping spoonful of watermelon mixture, sprinkle with Feta and dig in.